Home » Crisis » Be still. That’s enough! When I think of these words, I often picture God as a mom holding her restless infant close to her chest in a moment of fear or illness. “Shh. Mommy’s here.” I love that image. God sounds less like a mom whispering to her restless infant, and more like a mom addressing her toddler in full meltdown in the grocery store cereal aisle. Be still! That’s enough! Settle down! Knock it off! Reading it that way, another story comes to mind. Jesus and his disciples are crossing the Sea of Galilee when a storm pops up. The disciples are freaking out while Jesus sleeps on a cushion in the stern, the back of the boat—I looked it up. They wake Jesus up, indignant about his cavalier attitude toward the storm. “Don’t you care that we’re drowning?” they wail. Jesus wiped the sleep out of his eyes (I’m assuming), and “rebuked the wind and said to the sea, “Peace! Be still!” (Mark 4:35-41). The author Mark says Jesus addressed the wind and the waves. But he could just as easily have been talking to Mark and his 11 colleagues who just woke him up in a panic. Maybe Jesus is quoting Psalm 46. 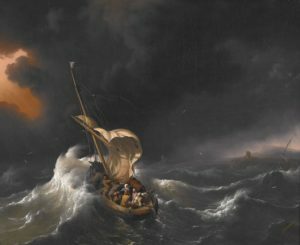 “Christ in the Storm on the Sea of Galilee” by Ludolf Bakhuizen (1695). Public domain via Wikimedia Commons. A wise friend once described his pastor as “the guy from the cartoon who walks through a room oblivious to the path of destruction he leaves behind him.” I have no idea what cartoon my friend was talking about, but I understood the point. We get so busy doing, we can become the storm—causing panic and destruction in our own lives and the lives of others. In the last 100 years, we English speakers created the word busyness to differentiate from business. We needed something to describe those times that we are doing much and accomplishing little. Macbeth describes this as “a tale told by an idiot, full of sound and fury, signifying nothing” (Shakespeare Macbeth). A storm of activity. Today, there is much to get us worked up—national politics, church politics, local issues, family dynamics, personal issues, illness, poverty—and as members of the body of Christ, we are called to serve. There is much to do, but our doing needs to be balanced with stillness, settling down and seeking God. Maybe God is calling you today because you are in the storm, or are the storm. Maybe you feel like the toddler melting down in the cereal aisle.